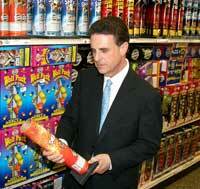 Millions of Fourth of July fuses waiting to be lit are a good sign for Bruce Zoldan and his family business, the B.J. Alan Company, the second largest importer and wholesaler of consumer fireworks in the United States. The company, based in Youngstown, Ohio, imports and markets cleverly packaged fireworks that spark, boom or whistle under its two main trade names, Phantom and Wolf Pack. And it turns out there is a very Jewish tint to the “the rocket’s red glare” – namely all five of the company’s principals: Zoldan and his wife, Rori, a sabra who runs the advertising and public relations, and his brother Alan and first cousin Jerry Bostocky, who both serve as vice presidents, and Weimer. “I’m the only one who is not part of the family,” Weimer says. It also sells wheels, firecrackers, and sparklers – everything you might need to light up a Fourth of July night. No, they have yet to market a spark emitting Havdalah candle. But at family bar and bat mitzvahs, and even at a wedding rehearsal dinner, the folks who run the company have had “outdoor and indoor pyrotechnic displays,” Weimer says. “We feel it’s important for Jews to be out in the community,” Weimer says. “We get a lot of churches and Little League groups,” Weimer says. Though fireworks, both aerial and ground-based, are legal in many states, some states and cities have either severely regulated or banned them, often citing safety concerns. In response, the company has been heavily involved with consumer safety. “We are one of the founders of the American Standards and Fireworks Laboratory,” Weimer notes, adding that this month, the company is organizing its first fireworks safety classes, in Florida and Ohio. Considering that Bruce and Alan Zoldan’s parents came to the United States from Russia and Austria-Hungary, one of their Grucci collaborations, the “New York Harbor Fountain,” might best illustrate the “coming to America” spirit illuminated by the family stories behind both companies. Pictured on the label is the first thing many immigrants saw upon entering New York Harbor: the Statue of Liberty – in this rendering, showered with red, white, blue, and golden sparks.